Several decades ago when I first started getting into Civil War reading, most general history books and many other types parroted the simplistic view that the major European armies dismissed the armies of both sides as "armed mobs" and saw few lessons to be learned from any serious study of the conflict. I was always skeptical of that but the topic didn't grab me enough to investigate deeper. At one time I had a copy of Jay Luvaas's classic The Military Legacy of the Civil War: The European Inheritance but don't recall if I read it. During the present mini-explosion of 1864-65 Richmond-Petersburg Campaign publications, discussion of the links between Civil War trench warfare and what occurred on the Western Front during the Great War, though the connection has been downplayed, has resurfaced. Recently I noticed a new study in the pipeline that addresses this topic and many others, Michael Somerville's Bull Run to Boer War: How the American Civil War Changed the British Army (Helion, January 2020). The description has me hooked. "The American Civil War is often said to have predicted the way in which later wars such as the Boer War and the First World War would be fought. As a result the British Army has been criticised for not heeding its lessons, a view that can be traced back to the 1930s. This book challenges that long-held view, and demonstrates that the responses to the lessons of the war in the British Army were more complex, better informed, and of higher quality, than normally depicted. Key to this new interpretation is that it takes a nineteenth century perspective rather than pre-supposing what the British should have seen based upon hindsight from the South African veldt or the Western Front trenches. It demonstrates that strategists and policy-makers reacted to the changes in the nature of warfare suggested by American experience, looks at how officers in the cavalry, infantry, artillery and engineers applied their observations in America to the technical and tactical issues of the day, and even examines the war’s influence on the development of aeronautics. In studying how the Civil War changed the Late Victorian British Army, the book provides insight into its learning process, and concludes that although sometimes flawed, its study of the American Civil War meant that it was better prepared for the wars of the twentieth century than previously acknowledged." by Gregory A. Mertz (Savas Beatie, 2019). 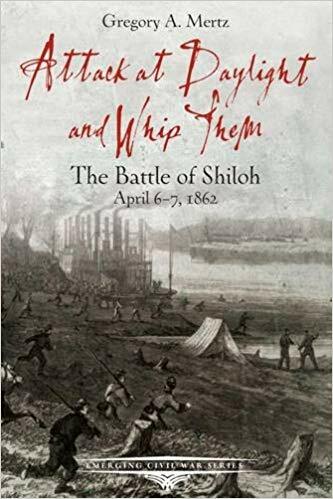 Having just left Chattanooga, the Emerging Civil War series stays out west with Gregory Mertz's Attack at Daylight and Whip Them: The Battle of Shiloh, April 6-7, 1862. It is one of those volumes that integrates tour and narrative together, as opposed to placing the driving tour at the back like most of the others (I seem to recall) have done. At least in terms of organization, it looks like the text primarily serves the tour here rather than the other way around. This means the battle narrative does not follow a strict chronology, with the content of the later chapters freely moving back and forth between Day 1 and Day 2 events. The concluding chapter examines the immediate aftermath of the battle. Mertz's book possesses the series's typical abundance of photographs and other illustrations. There are seventeen maps, which is an unusually large number for an ECW entry. The tactical maps depict the action at mostly brigade scale. The single appendix discusses Lew Wallace's ever controversial march to the battlefield on April 6. Army orders of battle and a brief suggested reading list round out the volume. by Jeffrey L. Patrick (State House Pr, 2018). 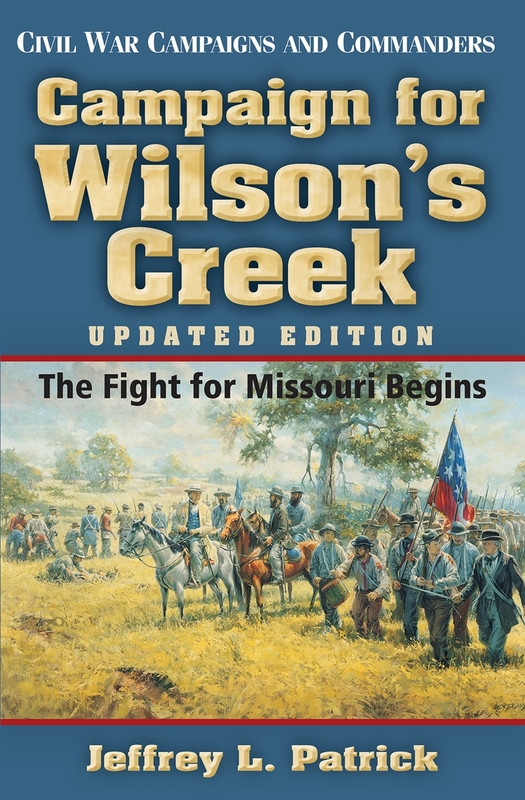 Originally published in 2011 as part of McWhiney Foundation Press's Civil War Campaigns and Commanders series, Jeff Patrick's Campaign for Wilson's Creek: The Fight for Missouri Begins presents audiences of all backgrounds an excellent overview history of the topic. I would still recommend as the best entry point for new readers. For some time now, McWhiney History Education Group has been publishing new titles, including this one, through their State House Press imprint. In Campaign for Wilson's Creek: The Fight for Missouri Begins, Updated Edition Patrick "tells the fascinating story of high-stakes military gambles, aggressive leadership, and lost opportunities. Campaign for Wilson's Creek is a tale of unique military units, untried but determined commanders, colorful volunteers, and professional soldiers. The first major campaign of the Civil War to take place west of the Mississippi River guaranteed that Missourians would be engaged in a long, cruel civil war within the larger, national struggle." At first glance, both editions (2011 and 2018) appear identical beyond the new cover art and copyright page (the latter has a 2018 date, though the book was released in 2019 within the last month). I emailed the publisher and asked if they could offer any information about changes between editions. The response from them indicated that "updated edition" primarily refers to the new book conforming to an updated style guide, with content additions/alterations much less significant. 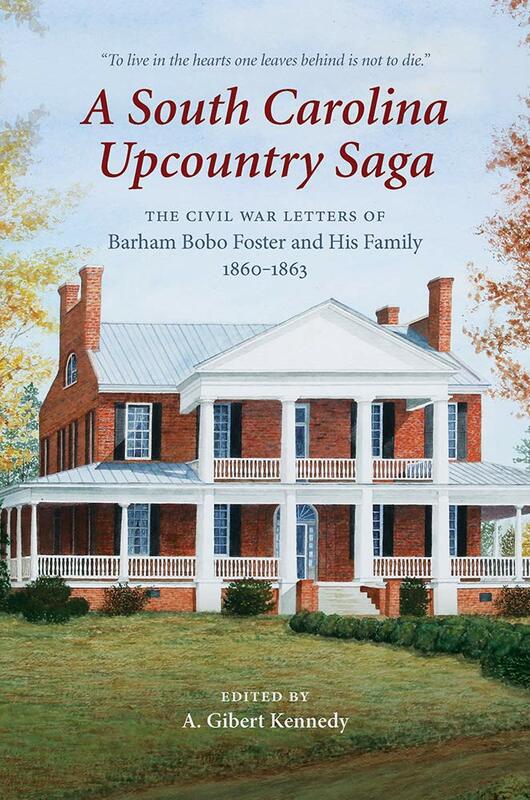 Review - "A South Carolina Upcountry Saga: The Civil War Letters of Barham Bobo Foster and His Family, 1860–1863" by Gibert Kennedy, ed. Before the American Civil War and its aftermath brought them devastating personal, material, and financial loss, the family of Barham Bobo Foster prospered in the Spartanburg District of Piedmont South Carolina. Worked by 43 slaves, Foster's corn and cotton plantation ("Foster's Tavern") was located in Glenn Springs just south of Spartanburg and near the railroad connecting the region with the rest of the state. Living with Foster were his wife, Mary Ann, and five children [sons Lewis Perrin and James Anthony "Toney", ages 23 and 22 respectively, and daughters Sarah Agnes "Sallie" (19), Eunice "Nunie" (15), and Jane Eliza (9)]. An ardent supporter of disunion and signer of the state's secession ordinance, B.B. Foster immediately offered his services to the state when war broke out and was commissioned lieutenant colonel of the Third South Carolina infantry regiment. Both sons eventually served in the same regiment and both gave their lives on its firing line. 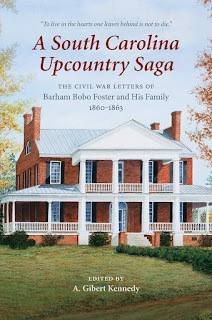 Their many letters home from the front are collected in A South Carolina Upcountry Saga: The Civil War Letters of Barham Bobo Foster and His Family, 1860-1863, edited by descendant A. Gibert Kennedy. The Foster correspondence is conventional in the sense that it contains many of the usual topics of conversation found in Civil War letter compilations. They speak of camp life, ordeals of epidemic disease, troubles getting properly uniformed and equipped, concern over the welfare of loved ones, complaints about the national mail system, and express common prejudicial views of the enemy's character and fighting ability. However, the Carter correspondence greatly exceeds the general run of Civil War letter collections when it comes to extensive descriptions of combat and other front line military experiences. While items of interest under their own limited personal purview predominate, the writers also occasionally offer astute critiques and observations of Confederate leaders and strategy. For example, the elder Foster condemns the Davis administration's dispersal of Confederate military strength, favoring instead a concentration of force even if that meant abandoning territory to the enemy. Modern historians have widely adopted this very same criticism of what would come to be known as Davis's "cordon defense" strategy. After a brief training period in their home state, the Third South Carolina was sent to the main front in Virginia. The regiment was not heavily engaged at First Manassas, but its involvement in the afternoon pursuit is heavily discussed in the Foster letters. Even more detail is provided of the picket war in northern Virginia both prior to the Bull Run battle and for months afterward. The letters of both B.B. and L.P. Foster (Toney would not join the army until the following spring) are strongly tinged with localism. Though the Fosters were Virginians themselves only two generations before they relocated to South Carolina, they question Virginia's late-to-the-game patriotism and capacity for bravery, though this distrust was softened after hearing about their Bull Run exploits. Curiously, the writers deplore the abundance of "Yankees" and lack of "true Virginians" found among the civilian population living in the northern part of the state (opinions shared 150 years later in some circles!). B.B. Foster also complains of cultural and political divides between Piedmont and Tidewater South Carolinians. In January 1862, the Foster patriarch was forced to resign from the army due to his development of a severe case of chronic limb edema. Soon after Foster left for home, the army began its evacuation of northern Virginia in response to threatening Union movements. This period coincided with the expiration of the Third's original twelve-month term of enlistment and growing uncertainty in its ranks over the details of the soon to be enacted Conscription Act. Perrin faced indecision over whether to reenlist in Virginia or wait until the regiment returned to South Carolina after mustering out. As expressed in his letters, his fear was that he might be forced into general conscription (and perhaps be sent to another unit not of his choosing) if he waited too long. His letters show the widespread confusion in the army over how conscription would work for those already serving. Those not yet in the army were also uncertain, and Anthony eventually joined the 13th South Carolina, led by his cousin Col. Oliver Edwards, in advance of conscription as well. He soon after transferred to the Third, and his letters add another dimension to the book. The Third missed the fighting at Seven Pines/Fair Oaks, but engaged in frequent skirmishing south of the Chickahominy prior to Lee's Seven Days offensive. These actions are recounted in Perrin's letters. Part of Kershaw's Brigade, the regiment's Seven Days exposure, at least in terms of significant fighting, was limited to Savage's Station and Malvern Hill. Both Perrin and Anthony Foster penned several useful accounts of the fighting on those days (particularly for June 29). Details are frequently repeated (as the writers retold the same events in letters sent to several different family members) but this is rather a plus to readers as each version offers additional pieces of information absent in the others. Frequently sick with some ailment or another, Perrin took ill again with skin and joint disease after the Peninsula Campaign. During his lengthy recovery he missed both Second Manassas and Antietam, while brother Anthony was killed on September 13 during an assault on Maryland Heights. Numerous letters written by Toney's comrades to the family are reproduced in the book. They offer the Fosters condolences and provide the family with the particulars of his death and burial. Perrin returned to the army in late October. His letters home over the following weeks describe the extended preamble to the Battle of Fredericksburg and the settling in of both armies on opposite banks of the Rappahannock. Tragically, on December 13 Perrin was shot in the head and killed near the Marye House when his regiment was ordered from its initial position near the Telegraph Road to reinforce the stone wall defenders. With both Foster sons now dead, no more letters passed from the fighting front to the home front but Kennedy includes a number of other family letters expressing grief and sympathy. B.B. Foster briefly returned to the war as a militia officer and the war largely ruined his finances, forcing him into bankruptcy for unpaid property taxes during Reconstruction. Later, with the help of his family, Foster became a merchant of modest prosperity. Kennedy does fine work editing the Foster correspondence, supplementing the material with letters written by friends and extended relations. In addition to penning a general family history introduction founded in fairly extensive genealogy research, Kennedy also includes a number of photos and a helpful set of maps. His footnotes are primarily focused on identifying individuals mentioned in the letters, but the editor's chapter introductions and bridging war narrative work well together in effectively contextualizing the letters. Wounds and death constantly hover over the letters contained in A South Carolina Upcountry Saga. Their oppressive aura of tragedy, enhanced by the battlefield deaths of writers Perrin and Toney themselves, underscores in exceptional fashion the concentrated human devastation wrought by the conflict. With low-end Civil War mortality estimates of 25% of military-age southern white males, the Foster family's complete sacrifice of its male line to the Confederate war effort vividly reminds readers how deeply this scale of mass death infiltrated all levels of southern society. In addition to documenting one family's story of tragedy and loss, the correspondence also serves as a valuable firsthand resource for those researching the war service of the Third South Carolina over the first half of the conflict. Recommended. 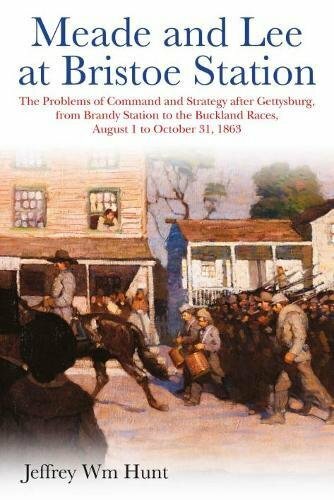 • Meade and Lee at Bristoe Station: The Problems of Command and Strategy after Gettysburg, from Brandy Station to the Buckland Races, August 1 to October 31, 1863 by Jeffrey Wm. Hunt (Savas Beatie, 2019). Meade and Lee at Bristoe Station: The Problems of Command and Strategy after Gettysburg, from Brandy Station to the Buckland Races, August 1 to October 31, 1863 is the middle volume in Jeffrey Hunt's planned trilogy covering the war in the East between the Gettysburg retreat/pursuit and the launching of the Overland Campaign in 1864. This is a significant project as the period, though receiving more attention lately, has been one of the more neglected ones for the war's most thoroughly documented theater. The first volume, Meade and Lee After Gettysburg (2017), meticulously recounted the fortnight of events and decision making between Lee's escape across the Potomac to the establishment of a new defensive line along the upper Rappahannock. Both Union and Confederate perspectives are accorded equal weight in the narrative. A substantially thicker study, this book examines a much longer period of active infantry and cavalry maneuvering, its centerpiece being the Bristoe Campaign. Even after the horrendous losses at Gettysburg, both armies were diminished further by the need to reinforce the West. "Despite these reductions, the aggressive Lee assumed the strategic offensive against his more careful Northern opponent, who was also busy waging a rearguard action against the politicians in Washington." As an item of further interest, and as mentioned in the previous book, this campaign season was the only one conducted by Meade as a truly independent army commander. Meade and Lee at Bristoe Station "is a fast-paced, dynamic account of how the Army of Northern Virginia carried the war above the Rappahannock once more in an effort to retrieve the laurels lost in Pennsylvania. When the opportunity beckoned Lee took it, knocking Meade back on his heels with a threat to his army as serious as the one Pope had endured a year earlier. As Lee quickly learned again, A. P. Hill was no Stonewall Jackson, and with Longstreet away Lee’s cudgel was no longer as mighty as he wished. The high tide of the campaign ebbed at Bristoe Station with a signal Confederate defeat. The next move was now up to Meade." Hunt's work is "is grounded upon official reports, regimental histories, letters, newspapers, and other archival sources. Together, they provide a day-by-day account of the fascinating high-stakes affair during this three-month period." Click here to read my review of the first volume. 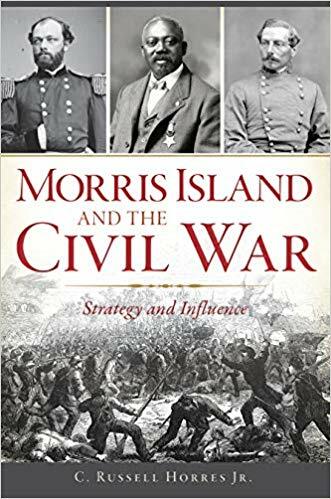 • Morris Island and the Civil War: Strategy and Influence by C. Russell Horres, Jr.
(Arcadia Pub & The Hist Press, 2019). With scale of military activity at any given time varying between routine patrols and desperate battles, the period between the return of Union troops to the barrier islands near Charleston in late 1861 and the fall of the city in February 1865 is often said to be the longest continuous campaign of the Civil War. A key piece of military geography used by both sides at times during the war was Morris Island, the topic of Russell Horres's Morris Island and the Civil War: Strategy and Influence. A retired scientist, Horres has volunteered extensively as a researcher and guide for the National Park Service, his interests and work focusing on Charleston and particularly on forts Sumter and Johnson. From the description: "From Charleston's doorstep, Morris Island held a critical position in the Civil War. It was first used by Confederates to assist in the bombardment of Fort Sumter and later became the scene of an epic struggle to prevent Union forces from gaining control. After the battle, the roles reversed, and Union forces used the site to bombard Fort Sumter and Charleston. Hundreds lost their lives, and both sides expended a vast amount of war capital for what appeared to be little value. Confederates greatly underestimated how events at Morris Island played into the hands of the Civil War's master strategist, Abraham Lincoln." From the chapter headings, it looks like the book addresses all the major military events that occurred on the island, with dual perspectives (Union and Confederate) on everything. Equal attention is paid to both halves of the war, with the "siege" aspect of the campaign beginning in earnest in 1863. A little bit over 100 pages, it's a brisk narrative, and the volume is well illustrated with drawings, photographs, and old maps. • Union Command Failure in the Shenandoah: Major General Franz Sigel and the War in the Valley of Virginia, May 1864 by David A. Powell (Savas Beatie, 2019). David Powell is, of course, one of the leading experts on the Battle of Chickamauga, but his research and views on other topics outside the mountainous wilds of the Tennessee-Georgia border have invariably proved interesting as well. 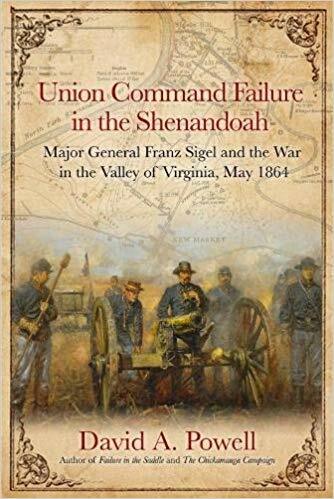 His new book Union Command Failure in the Shenandoah: Major General Franz Sigel and the War in the Valley of Virginia, May 1864 examines from the Union perspective the western wing of Grant's multi-pronged spring offensive in the eastern theater. From the description: "Union General Ulysses S. Grant regarded a spring campaign in the Valley of Virginia as integral to his overall strategy designed to turn Robert E. Lee’s strategic western flank, deny his Army of Northern Virginia much needed supplies, and prevent other Confederates from reinforcing Lee. It fell to Union general and German transplant Franz Sigel to execute Grant’s strategy in the northern reaches of the Shenandoah while Maj. Gen. George Crook struck elsewhere in southwestern Virginia. Sigel’s record in the field was checkered at best, and he was not Grant’s first choice to lead the effort, but a combination of politics and other factors left the German in command. Sigel met Confederate Maj. Gen. John C. Breckinridge and his small army on May 15 just outside the crossroads town of New Market. The hard-fought affair hung in the balance until finally the Union lines broke, and Sigel’s Yankees fled the field. Breckinridge’s command included some 300 young men from the Virginia Military Institute’s Corps of Cadets. VMI’s presence and dramatic role in the fighting ensured that New Market would never be forgotten, but pushed other aspects of this interesting and important campaign into the back seat of history." "Previous works have focused on the Confederate side of the battle, using Sigel’s incompetence as sufficient excuse to explain why the Federals were defeated. This methodology, however, neglects the other important factors that contributed to the ruin of Grant’s scheme in the Valley." Not another micro-treatment of the New Market battle (we already have that in spades, the best being Charles Knight's Valley Thunder), the book is broader in scope. Though it does include a multi-chapter account of the Battle of New Market, Powell's book is more of an operational-scale examination of parallel Union offensive movements in West Virginia (the campaign there culminating in the Battle of Cloyd's Mountain) and the Shenandoah Valley. 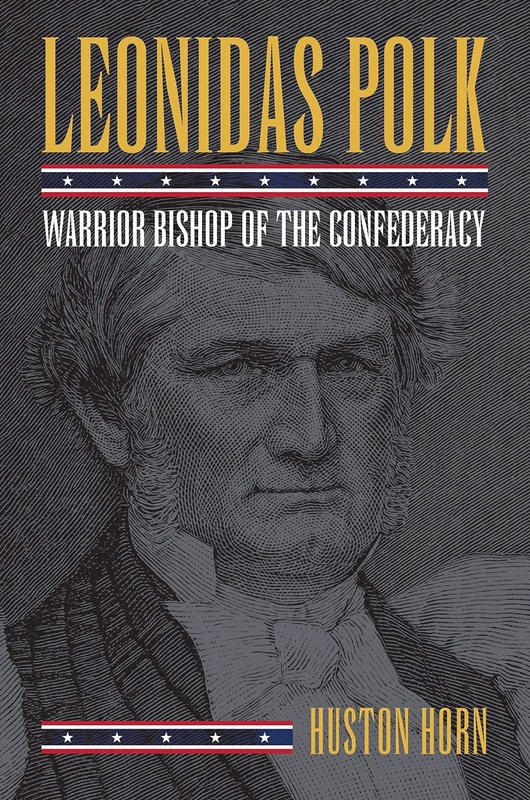 • Leonidas Polk: Warrior Bishop of the Confederacy by Huston Horn (UP of Kansas, 2019). Among the group of longest serving generals in the Confederacy's western high command, Leonidas Polk has to be second only to Braxton Bragg in arousing historical controversy and questions over his competence. Oddly enough, though, he was very popular with the men he led. Nothing grabbed me long ago when I leafed through the two existing major biographies of Polk, so I welcome this new treatment. William C. Davis certainly has high praise for Huston Horn's Leonidas Polk: Warrior Bishop of the Confederacy, deeming it "the best Confederate military biography of recent years." I certainly agree with the other jacket blurb writer, Sam Davis Elliott, that we are "long overdue" for a complete reevaluation of the general. As most readers know, Polk was one of those West Point graduates who immediately resigned to pursue other opportunities, in his case the Episcopal priesthood. "At first combining parish ministry with cotton farming in Tennessee, Polk subsequently was elected the first bishop of the Louisiana Diocese, whereupon he bought a sugarcane plantation and worked it with several hundred slaves owned by his wife. Then, in the 1850s he was instrumental in the founding of the University of the South in Sewanee, Tennessee. When secession led to war he pulled his diocese out of the national church and with other Southern bishops established what they styled the Protestant Episcopal Church in the Confederate States of America. Polk then offered his military services to his friend and former West Point classmate Jefferson Davis and became a major general in the Confederate Army." More from the description: "Recognizing his indispensable familiarity with the Mississippi Valley, Confederate president Jefferson Davis commissioned his elevation to a high military position regardless of his lack of prior combat experience. Polk commanded troops in the Battles of Belmont, Shiloh, Perryville, Stones River, Chickamauga, and Meridian as well as several smaller engagements in Georgia leading up to Atlanta. Polk is remembered for his bitter disagreements with his immediate superior, the likewise-controversial General Braxton Bragg of the Army of Tennessee. In 1864, while serving under the command of General Joseph E. Johnston, Polk was killed by Union cannon fire as he observed General Sherman’s emplacements on the hills outside Atlanta." Modern assessments of Polk's military ability and subordinate behavior have been almost overwhelmingly negative, so I will be very curious to read Horn's take on Polk's Civil War career. The description is coy about revealing any areas of major revisionist views. The 20-page bibliography gives off the vibe of deep research. The only negative thing that immediately jumps out is the complete absence of maps in the book, though that is less of a problem in high-level biographies like this one. Looking forward to reading it. During the American Civil War, Great Britain and Second Empire France were the two nations that the Confederacy desired diplomatic recognition from most. Both world powers had powerful militaries and were long-established trading partners with deep and complex shared histories with the North American continent. The language barrier to accessing essential source material combined with the widely held perception that Britain was by far the more diplomatically important of the two European empires has led U.S. scholars to focus mostly on the Anglo-American relationship. However, the recent work of Sorbonne historian Stève Sainlaude has accomplished much in the way of bridging this linguistic and interpretive gap in understanding. His scholarship produced from mastery of French archives has resulted in two award-winning books on French policy during the Civil War. Le gouvernement impérial et la guerre de Sécession (1861-1865): L'action diplomatique (2011) offers readers a general overview while La France et la Confédération sudiste. La question de la reconnaissance diplomatique pendant la guerre de Sécession (2011) examines Franco-Confederate relations at greater depth. With the assistance of translator Jessica Edwards, the Anglophone audience can now read a scholarly synthesis of those two earlier French-language works. 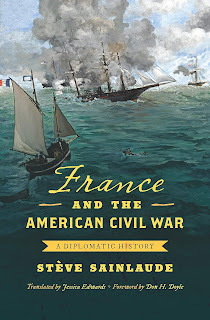 Among other strengths, Sainlaude's France and the American Civil War: A Diplomatic History provides a much-needed counterpoint to the prevailing view that French diplomacy during the American Civil War had an influence clearly secondary to Britain's and looked to its neighbor across the channel to lead the way on U.S.-Confederate policy matters. Sailaude's study shows that France, while its foreign office clearly explored open cooperation with Britain to avoid geopolitical isolation, acted with far more self-interested independence than previously credited by most historians of Civil War period international relations. Though its title might suggest a broader approach to the topic, the book focuses most strongly on Franco-Confederate diplomatic interactions, where the author's particular scholarly expertise lies. The study begins with a summary of France and Britain's declarations of neutrality, their positions on the blockade (and its effectiveness), and their granting of belligerency status to the new Confederacy. Other related issues, such as European worries over how both American combatants would respect the rights and protections of foreign citizens in a war zone, are also discussed. In addition to providing necessary British context to what is a study of French diplomacy, the section offers a fine introduction to the most significant points of international law that needed to be addressed by all nations concerned. France's Emperor Napoleon III sympathized strongly with the Confederacy. This was accompanied by a deep personal antipathy felt toward the United States, an aristocratic disdain that apparently strengthened during his brief New York residency and travels in the North. However, Napoleon's personal desires were frequently in conflict with how the professional diplomats of France's Ministry of Foreign Affairs (the Quai d'Orsay) viewed the empire's interests best served. One of the book's strongest and most pervasive themes revolves around the successes Napoleon's chief diplomats had in thwarting the emperor's off and on efforts to promote recognition of the Confederacy through mediation—his bursts of initiative by no coincidence timed at key moments of perceived Confederate high tide in July 1862 and June 1863—as well as the emperor's desire to construct warships to sell to the Richmond government. In Sainlaude's view, Minister Thouvenel and his successor Drouyn de Lhuys were the chief and most effective guardians of French national interests during the war. Both men demonstrated uncommon bureaucratic skill in checking Napoleon's wilder impulses. They effectively blocked the emperor's pro-Confederate backdoor channels and consistently outmaneuvered badly outclassed Confederate diplomats; and they did this all while retaining the favor and good will of the emperor. Given their actions, it seems almost remarkable that neither was sacked. The author could find no good explanation for why Napoleon did not force the resignation of diplomats so opposed to his initiatives, but apparently the emperor deeply respected the bureaucratic professionalism of both men. France diplomats also excelled in navigating the information war, effectively separating truth from propaganda in order to arrive at informed policy decisions. In the end, Sainlaude's sources reveal that French officials were remarkably well-informed on the resources, strengths, and weaknesses of the opposing sections and were able to feed accurate information to Paris throughout the war. The French were convinced relatively early on that the North would win as long as popular will held out, and they geared their diplomacy toward future relations with the United States on that basis. The book cites the wartime dispatches of Richmond consul and ardent Jefferson Davis critic Alfred Paul as particularly accurate and influential both in their astute assessment of the South's vulnerabilities and their remarkable prescience in predicting the course of the war. The author also points out several lesser appreciated areas, such as military and trade matters in the Far East, through which France viewed cooperation with the U.S. as important to maintain. Sainlaude argues effectively in the book that the 1860s strength of French and British rapprochement (part of the off and on "entente cordiale" that existed during the nineteenth century beginning in 1830) has been overestimated in the historical literature. French ministers, far from reluctantly towing the British diplomatic line of restraint, opposed recognizing the Confederacy because it was best for French self interest. European concerns always held primacy, and even Napoleon himself came to see British naval power as more threatening to his own plans in the Americas (more on that later) than a unified and expansionist U.S. This concern touches upon another important theme of French diplomacy during the American Civil War, the truth that many of the most pressing issues lacked anything resembling a clear or consistent path to follow or "side" to take. Inherent contradictions in policy direction, particularly those related to the imperial venture in Mexico, all too often proved maddeningly impossible to resolve to the primary benefit of France. Contrary to the how the matter has been traditionally expressed in the literature, Sainlaude's research in French archives and newspapers has revealed that popular sympathy with the plight of the southern people and the merits of the Confederate cause were by no means widespread in France. While the Confederacy had its defenders in the emperor and his backers, much evidence points toward the popular majority's rejection of southern attempts to paint themselves as a distinct, freedom-loving people of European-style refinement. Instead, the liberal press latched onto the inherent contradictions of freedom and slavery and generally decried the rebellion as unjustified, additionally seeing the South as violently aggressive and the Davis presidency unchecked and overly authoritarian (though the Lincoln administration was also sometimes criticized on similar grounds). While slavery definitely harmed the image of the South in France and well-publicized events like the publication of Uncle Tom's Cabin and the 1859 execution of John Brown had as much affect on popular antislavery feeling on the continent as it did in the North, the issue did not hold much sway in French diplomacy, which greatly favored practical national self-interest over humanitarian considerations. According the the author, this was a major difference in French versus British handling of how the institution might affect the possibility of official recognition. In Sainlaude's view, Napoleon III's ultimate turn away from support of the Confederacy was an act of shrewd pragmatism that gained him important friends among the large reform elements of the home population who during the war drew frequent parallels between southern oppression of blacks and imperial suppression of freedom in France. When it came to carrying out Napoleon III's "Grand Design" of a French-led Pan-Latin geopolitical bloc in the western hemisphere that would serve to contain Anglo-American expansion (only part of which was the puppet government installed in Mexico) , the American Civil War proved to a source of both frustration and opportunity. While permanent division of the United States might have seemed to be an ideal situation for facilitating Napoloen's plan, it was full of potential pitfalls. Though the Confederates outwardly supported the French occupation of Mexico as part of its gambit for official recognition, the French quickly came to realize that southerners were just as hostile as the U.S. to a European presence on the continent (especially one on its very borders). Napoleon and his diplomats in North America also well knew that it was southern leaders who were chiefly behind antebellum filibustering expeditions launched from the U.S. Long-held southern dreams of annexing large portions of Central America and the Caribbean directly conflicted with Napoleon's plan to include those very same lands in his own new sphere of influence. French officials additionally found Confederate declarations that secession ended their need for southern expansion highly unconvincing. Napoleon and his ministers were also certain that recognition of the Confederacy would lead to war with the North, and the capability of the massive new U.S. Navy to interdict French shipping and lines of communication with its forces in Mexico deeply concerned them. In the end, Napoleon's best prospect was for a long Civil War that would exhaust both combatants and allow the French time to firmly establish themselves in Mexico, though hope in some circles that the U.S. might recognize Maximilian's government as a sign of appreciation for France's restrained Confederate policy was clearly a pipe dream. Of course, any thought of recognizing the Confederacy or intervening in the conflict was highly dependent on French confidence in the Confederacy's ability to both defend and govern itself. Though early Confederate victories impressed many within the French government, the most astute observers of the war quickly saw the cracks in the veneer of southern strength and their doubts about whether the Rebel experiment in nation building could succeed quickly gained strength and influence over the next two years. By mid-1863 French consuls on the ground in America and diplomats in Paris collectively came to the conclusion that an independent southern nation was not viable, or even desirable. This was accompanied by the growing belief that some new federated arrangement was both inevitable and most compatible with French interests looking forward. The book clearly recognizes that trade concerns were integral to foreign policy formulation, and it finds estimates of the South's value to France as a trading partner commonly exaggerated in the general literature. Through incisive citation of key economic facts and figures, Sainlaude's study shows southern cotton to be far from "king" when it came to trade with France. While the American Civil War caused significant economic disruption on the continent, France's textile industry (and overall population percentage that worked in jobs associated with cotton), though large, was only a fraction of Britain's. Like Britain, France held large cotton reserves at the start of the war and was able to replace a large part of any future deficit through other sources, though it hurt national pride to be dependent on British cotton. Potential social unrest was shrewdly deterred by a large infusion of public welfare spending, and the nature of the French textile industry (which, unlike Britain's, was still heavily craft-based) meant that workers could more readily turn to other sources of supplemental income. Added to all this, the blackmail perception of the initial southern cotton embargo angered the French public when their goodwill was most deeply prized. In contrast, French trade with the North in silks and other luxuries was an immensely lucrative part of the French export economy, and country was in turn heavily dependent on northern grain imports. If any trade relationship with North America was truly essential for France to maintain, it was the one with the United States. France and the American Civil War represents an extremely significant contribution to the scholarly study of transatlantic international relations during the period. It will surely assume the position of the premier English-language study of French diplomacy during the Civil War period. 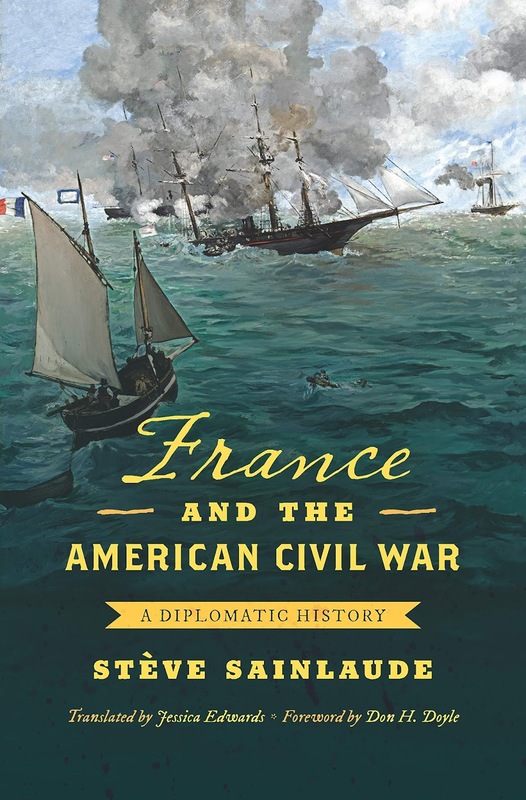 Through judicious interpretation of previously neglected French sources, Stève Sainlaude's study offers U.S. readers a highly original, nuanced, and deeply persuasive portrait of French positions on the most important diplomatic issues associated with the Civil War. Providing clarity while wading through many apparent contradictions, the author convincingly explains why France's seemingly pro-Confederate authoritarian regime nevertheless rejected official recognition of the rebellious confederation and instead saw its present and future national interests best served by maintaining relations with the United States, a choice one might reasonably find at odds with the country's imperial designs in Mexico and other parts of the western hemisphere. Very highly recommended. • The Civil War on the Rio Grande, 1846-1876 edited by Roseann Bacha-Garza, Christopher L. Miller, and Russell K. Skowronek (TAMU Press, 2019). 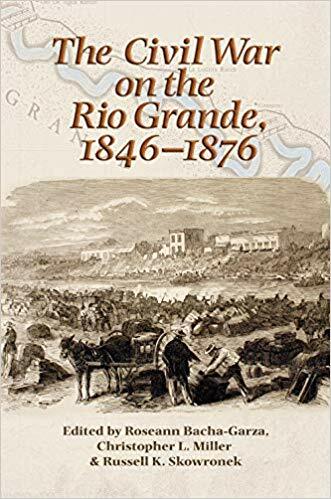 The Civil War on the Rio Grande, 1846-1876 is the scholarly companion to Blue and Gray on the Border: The Rio Grande Valley Civil War Trail. In it editors Bacha-Garza, Miller, and Skowronek oversee a collection of essays that take a deeper look at themes first explored in the earlier trail guide. The anthology "provides the scholarly backbone to a larger public history project exploring three decades of ethnic conflict, shifting international alliances, and competing economic proxies at the border." More from the description: "To understand the American Civil War in Texas also requires an understanding of the history of Mexico. The Civil War on the Rio Grande focuses on the region’s forced annexation from Mexico in 1848 through the Civil War and Reconstruction. In a very real sense, the Lower Rio Grande Valley was a microcosm not only of the United States but also of increasing globalization as revealed by the intersections of races, cultures, economic forces, historical dynamics, and individual destinies." Among other topics, essays examine what life was like on the border during the Civil War, mixed-race colonies along the Rio Grande, the wartime cotton trade, the rivalry between Juan Cortina and Santos Benavides, the archaeology of Palmito Ranch, and the black military experience on the Texas-Mexico border (particularly during the first few years of Reconstruction). 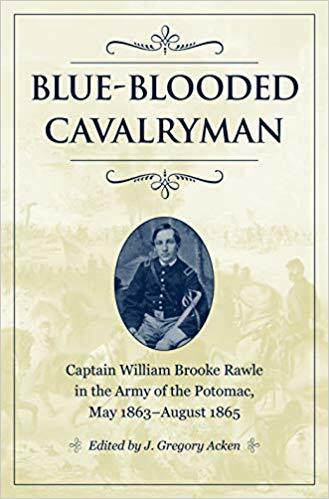 • Blue-Blooded Cavalryman: Captain William Brooke Rawle in the Army of the Potomac, May 1863–August 1865 edited by J. Gregory Acken (Kent St UP, 2019). From the description: "In May 1863, eighteen-year-old William Brooke Rawle graduated from the University of Pennsylvania and traded a genteel, cultured life of privilege for service as a cavalry officer. Traveling from his home in Philadelphia to Virginia, he joined the Third Pennsylvania Cavalry and soon found himself in command of a company of veterans of two years’ service, some of whom were more than twice his age. Within eight weeks, he had participated in two of the largest cavalry battles of the war at Brandy Station and Gettysburg. Brooke Rawle and the Third Pennsylvania Cavalry would serve with the Cavalry Corps of the Army of the Potomac through April 1864, fighting partisans and guerillas in Northern Virginia and also seeing action during the Bristoe Station and Mine Run battles of late 1863." "A meticulous diarist and letter writer, Brooke Rawle documented nearly everything that came under his observant eye in 150 well-written letters home to his family." Edited by Gregory Acken, Blue-Blooded Cavalryman: Captain William Brooke Rawle in the Army of the Potomac, May 1863–August 1865 collects Rawle's wartime writings, which "provide a fascinating, richly detailed look into the life of a regimental cavalry officer during the last two years of the Civil War in the East." Acken has a good eye for interesting material and did a superb job editing the Signal Corps memoir of Capt. Louis Fortescue. We can surely expect the same quality of work here. In addition to providing extensive explanatory endnotes, Acken supplements and contextualizes the Rawle letters and diaries with lengthy book and chapter introductions while also inserting helpful bridging narrative throughout. Photographs are plentiful and the book also possesses a fine set of George Skoch maps. In the last two volumes, the Civil War Strategies and Soldiers series has stretched its range to include edited diaries/letters. Relatively new (with now eight titles published since 2013), it's one of the best active series out there, and I always look forward to what's next. • Raising the White Flag: How Surrender Defined the American Civil War by David Silkenat (UNC Press, 2019). 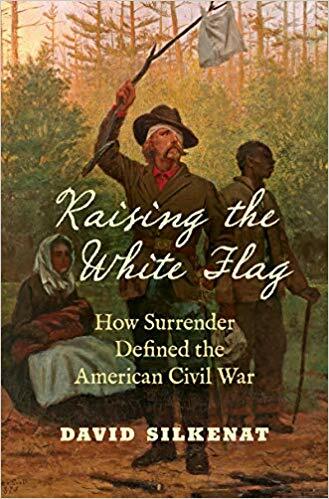 Silkenat's Raising the White Flag "provides the first comprehensive study of Civil War surrender, focusing on the conflicting social, political, and cultural meanings of the action. Looking at the conflict from the perspective of men who surrendered, Silkenat creates new avenues to understand prisoners of war, fighting by Confederate guerillas, the role of southern Unionists, and the experiences of African American soldiers. The experience of surrender also sheds valuable light on the culture of honor, the experience of combat, and the laws of war." The growth of interdisciplinary studies has been one of the more refreshing developments in Civil War scholarship over the past few decades. For example, the intersection of conflict archaeology and traditional Civil War documentary research has yielded an abundance of fascinating and frequently eye-opening articles and books. More confined to the domain of specialist journals has been the investigation of how geology created tactically significant topographical features of all kinds and shaped how particular Civil War battles were fought. Synthesis and interpretation of much of this work on numerous battlefields can be found in geologist Scott Hippensteel's new book Rocks and Rifles: The Influence of Geology on Combat and Tactics during the American Civil War. Beginning with the fundamental truth that the diverse landscapes upon which Civil War battles were fought were products of varying geological processes and differential weathering (both physical and chemical) that occurred over eons of time, the book explores how this geology specifically influenced the course and conduct of a select group of battles. By contrasting major differences in rock types underlying numerous Civil War battlefields, the book also attempts to show how such formations helped shape warfare at multiple scales—strategic, operational, and tactical. Hippensteel's study begins with a brief introduction to the geological history of the eastern United States that provides readers with some helpful basic 'rules' regarding what kinds of surface terrain features are the typical result of the weathering of particular rock types and sub-types. The author also defines the five geological "provinces" (Appalachian Plateau, Valley and Ridge, Blue Ridge, Piedmont, and Coastal Plain) that make up the continental landscape east of the SW-NE running Appalachian mountain range and summarizes some general effects the major characteristics of each province had on military operations. For example, Piedmont geology generally offered both armies rolling and/or undulating ground well suited for fighting large, open battles with constraints to mass movements provided mostly by rivers. In terms of judging terrain by how well it aided defense, Piedmont geology regularly produced highly defensible ridges (the result of igneous rock intrusions) for Civil War armies to exploit as well as large expanses of ground containing deep, loose (but still adhesive) soils excellent for rapid earthwork construction. Though most Civil War battlefields were underlain by more than one type of rock, Hippensteel organizes his largely self-contained discussions of eastern and western theater battles (ten chapters in total) around the most consequential of the earth's three basic rock categories: igneous (Second Manassas, Gettysburg), metamorphic (South Mountain, Spotsylvania Court House, Kennesaw Mountain) and sedimentary (Antietam, Fredericksburg, Stones River, Petersburg, Morris Island). Within each chapter is a strategic-level background overview and operational and tactical summaries of the battle under consideration. These sections are accompanied by a natural history of the geology of the battlefield and surrounding area along with a more focused examination of those tactical aspects of the battle most affected by geology. In discussing "tactical" influences in the book the author is not referring to particular small unit or formation-level innovations designed to overcome or exploit specific geological features but rather the tactical-scale effects of the terrain geology. For the purposes of the review, the following three paragraphs will discuss one battle from each rock grouping. This should be sufficient to provide potential readers with a sense of the kind of interpretation and analysis present in the book. While the Union error of not securing the Thoroughfare Gap passage cut through the metamorphic quartzite ridges that surrounded it greatly aided the Confederate victory at Second Manassas, it was the igneous rock diabase ridge occupied by Stonewall Jackson's Corps that provided the tactical focal point of the battle. The long strip of rocky high ground allowed Jackson's men to withstand wave after wave of Union assaults, but geology also provided opportunity to the attackers. The two most dangerous threats to Jackson's line achieved by the Federals illustrate well a common truth that points of contact between different rock types often formed the most vulnerable areas of any defensive position. In this case, two stretches of lower ground existed along the unfinished railroad grade where the erosion-resistant igneous diabase gave way to the softer sedimentary deposits that formed the eastern part of the battlefield. The fighting at Second Manassas also produced the war's best and most vivid example of the tactical use of geology at the level of the individual, when Confederate soldiers threw large rocks at the Union attackers after their ammunition was exhausted. The Spotsylvania battlefield sits atop "a confusing mess of ancient metamorphic and igneous rocks, fractured and folded to the point where their age and origin remain incompletely understood." (pg. 120). On the strategic and operational levels of the Overland Campaign, the more logistically friendly coastal plain meant that Grant would always favor bypassing the enemy's eastern flank, though he would still have to contend with the disadvantageous directional flow of the region's rivers. On a tactical level, Spotsylvania had two salient geological features that greatly affected how the battle was fought. The differential weathering of the metamorphic rock atop which sat Laurel Hill created a natural defensive position that was critical to repelling Union attacks there. Also, the metamorphic and igneo-metamorphic rocks in the area weathered to produced soils ideal for digging trenches and maintaining them without extensive revetment. This geology was essential to the survival of Lee's army when the collapse of the Mule Shoe salient necessitated a rapid in-battle creation of a new defensive line across its base. On the other side, the contact point between two rock formations produced a swale that allowed Union forces (on both May 10 and 12) to successfully cross open ground to attack the famous salient, the creation of which was itself influenced by the need to occupy higher ground produced by the same effects of two rock units coming together. Finally, any serious visitor to the Stones River battlefield is unlikely to forget the natural trenches created by the sedimentary limestone karrens formed there and used by Union general Philip Sheridan's division to repulse repeated assaults on December 31. Though only a meter deep the rock formation effectively shielded Sheridan's infantry, whose sustained occupation of the sector significantly disrupted the enemy attack. Less visible limestone outcrops also affected other parts of the battlefield, either by making entrenchment impossible for defenders or by creating isolated tactically-significant plots of land like the Round Forest. The latter could not be easily cleared for either agriculture or pasturage and thus were left rugged and timbered, making them difficult ground to attack. Complaints primarily revolve around the volume's editing problems. The book is riddled with typos and more ruthless editing might also have effectively reduced some of the more unnecessary content repetition. Fortunately, these distractions are largely offset by more positive aspects of the book's overall presentation, which includes a rather extraordinary collection of supplementary features. The book's pages fairly burst with photographs (b&w and color), maps, tables, charts, and diagrams, all usefully connected to the text. If you're like most readers with little geology knowledge beyond middle school earth science and the three basic rock categories (igneous, metamorphic, and sedimentary), the nomenclature presented in the book can be a bit daunting in places. However, the background help is far from unforgiving and astute readers lacking an advanced grounding in geology should have little problem absorbing a reasonable understanding of the main concepts through context and occasional search engine assistance. Authors are, of course, free to pursue their own interests, but it deserves mention that the book's limited geographical spread only tells part of the geological story of the Civil War. Several prominent examples of visible geology affecting Trans-Mississippi campaigns and battles spring to mind. The bluffs, rock ridges, and deep hollows intersecting the Pea Ridge battlefield in Arkansas to a great degree shaped the course of that battle and the geological legacy of the New Madrid Fault Line certainly influenced General John Pope's Island No. 10 campaign. 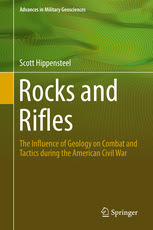 Overall, Scott Hippensteel's Rocks and Rifles succeeds admirably in bringing a renewed appreciation of geology to Civil War military history. It is certainly true that intimate knowledge of the ground is an essential prerequisite for comprehensive mastery of any given battle history, and Hippensteel's study offers readers and experts alike a series of fresh and informed glimpses of yet another layer of understanding. The diplomacy of Secretary of State William Seward has often been portrayed as dangerously militant during key moments of the American Civil War, but Joseph Fry's Lincoln, Seward, and US Foreign Relations in the Civil War Era sees the Lincoln-Seward partnership as not only having effectively navigated numerous wartime crises but prepared the foundation for a bright national future. "These unlikely allies, who began as rivals during the 1860 presidential nomination, helped ensure that America remained united and prospered in the aftermath of the nation's consuming war." In the book, Fry "examines the foreign policy decisions that resulted from this partnership and the legacy of those decisions. 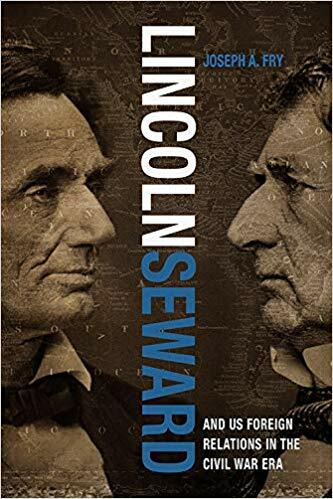 Lincoln and Seward, despite differences in upbringing, personality, and social status, both adamantly believed in the preservation of the union and the need to stymie slavery. They made that conviction the cornerstone of their policies abroad, and through those policies, such as Seward threatening war with any nation that intervened in the Civil War, they prevented European intervention that could have led to Northern defeat. The Union victory allowed America to resume imperial expansion, a dynamic that Seward sustained beyond Lincoln's death during his tenure as President Andrew Johnson's Secretary of State." More: "Fry's analysis of the Civil War from an international perspective and the legacy of US policy decisions provides a more complete view of the war and a deeper understanding of this crucial juncture in American history."